I first covered FileBrowser in an iPad Diaries column from January about finding a replacement for Transmit on iOS. As I noted in the story, FileBrowser didn't have the prettiest interface (to be fair, I still have to find a file manager that looks as nice as Transmit), but it offered superior integration with iOS 11 features such as drag and drop and Files. Something else I should have noted: the FileBrowser team is extremely receptive to criticism and new ideas. Over the past few weeks, I've been testing an updated version of FileBrowser (in the Business flavor) that addresses several limitations I covered last month. First and foremost, the action menu for selected items has received a fresh coat of paint that looks more in line with modern iOS design. If you're connected to an FTP server, the File Properties section of this list now lets you change file permissions, which wasn't possible before. In addition, if you tap 'Create a File Link', then 'Copy Relative URL', you'll get the relative path for a file on your server that you can easily combine with a TextExpander snippet or workflow to obtain a publicly shareable link for a selected file. I still prefer Transmit's ability to set a root URL beforehand, but this new option makes it easier to generate links with FileBrowser. The most important changes in this update, however, revolve around FileBrowser's integration with the Files app for iOS 11. While you still need to authenticate with external servers from the main FileBrowser app before viewing those folders in Files, it is now possible to create new folders and delete items in network-mounted FileBrowser locations in Files. I tested this functionality by creating a folder in my FTP server accessed from FileBrowser and viewed in Apple's Files app; it worked as advertised. I later changed permissions for the folder in the FileBrowser app, and deleted a handful of documents from the file provider. I still think FileBrowser's Files extension should be able to authenticate with external servers without requiring users to launch the app first, but the team is moving in the right direction with these additional Files features. My favorite improvement in FileBrowser for Business, though, is the fact that you can plug a SanDisk iXpand USB drive into an iOS device and browse its contents from Files without opening the FileBrowser app first. 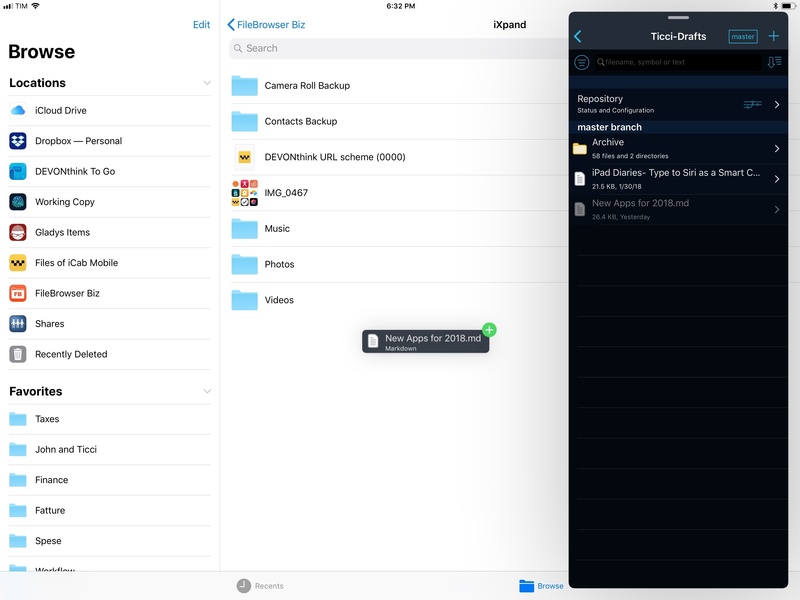 In the old version of the app, access to the Lightning-enabled USB drive could only be granted by the FileBrowser app; now, even if FileBrowser has been manually force quit, you can plug an iXpand drive into your iOS device, navigate to FileBrowser's location, and browse the contents of the drive directly from a dedicated iXpand folder. I can now back up my article drafts to a Lightning-powered USB drive using the Files app. 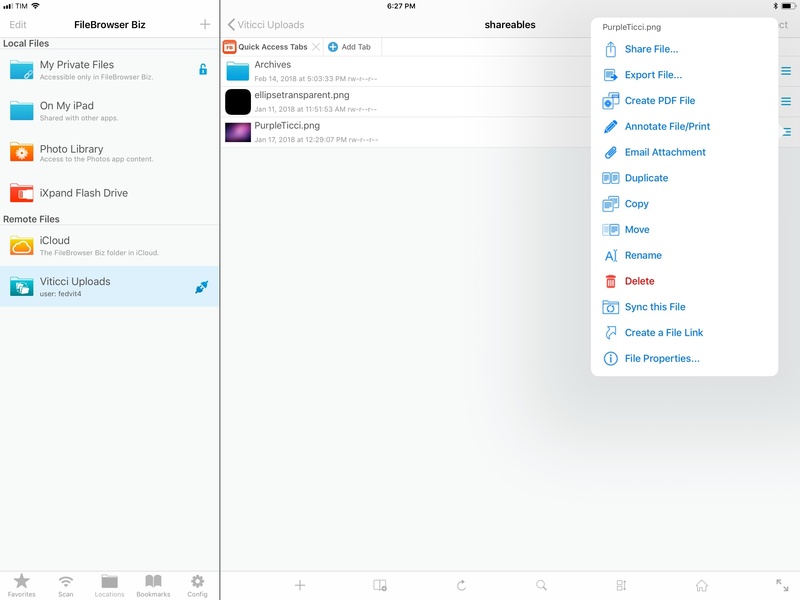 I tested FileBrowser's improved iXpand Drive integration with different types of documents, which I both dragged out of the Files location and dropped in it from other iPad apps. Despite some occasional error messages, file transfers always completed successfully and I was able to back up images, PDF documents, and more onto the drive only by inserting it into my iPad's Lightning port and opening FileBrowser's extension in Files. This integration solidifies the idea that I'd love to have native external storage access in a future version of Apple's Files app, either thanks to new ports on the iPad Pro, or with new Lightning adapters made by Apple. The ability to connect to any drive and treat it just like another location in Files wouldn't bring any complexity that hasn't already been solved by Files' location-based approach to dealing with multiple sources of documents. 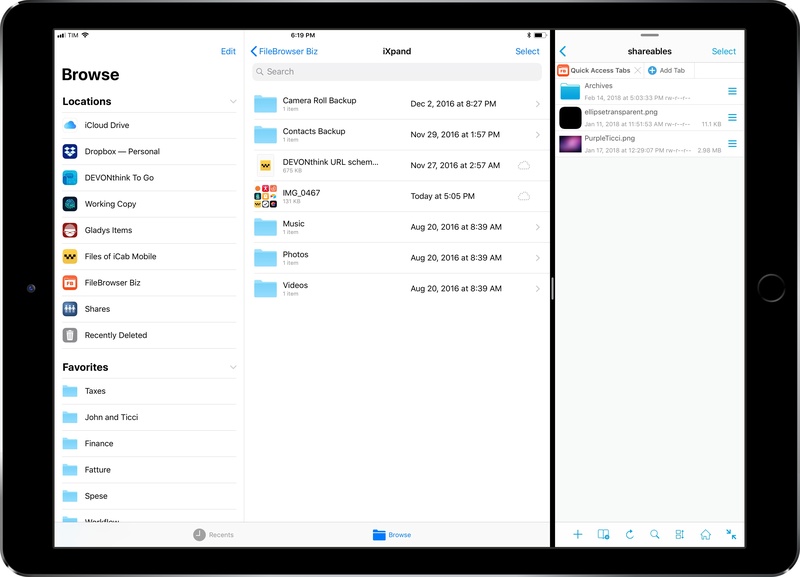 Until Apple extends Files to go beyond iCloud Drive and apps, FileBrowser remains the best option if you're looking for a file manager that supports a variety of external connections and also integrates deeply with iOS 11. The latest version of FileBrowser for Business is available on the App Store; you can read my previous coverage of FileBrowser here.